(《複数形》 coreopsis) 【植物, 植物学】 ハルシャギク. 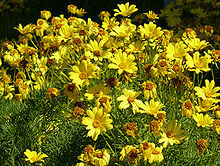 Any of several composite herbs, of genus Coreopsis, typically with bright yellow flowers. Coreopsis (pronounced /ˌkɒriːˈɒpsɨs/; common names include tickseed and calliopsis) is a genus of herbs in the family Asteraceae. Many of its 35 to 114 species are cultivated. Twenty-eight species are native to North America and the others come from Central and South America. The flowers are usually yellow with a toothed tip. They have showy flower heads with involucral bracts in two distinct series of eight each, the outer being commonly connate at the base. The name Coreopsis is derived from the Greek words κορις (koris), meaning "bedbug," and ὄψις (opsis), meaning "view," referring to the shape of the achene.